Everyone loves one-stop shopping. It's easy, convenient and saves you time and hassles. 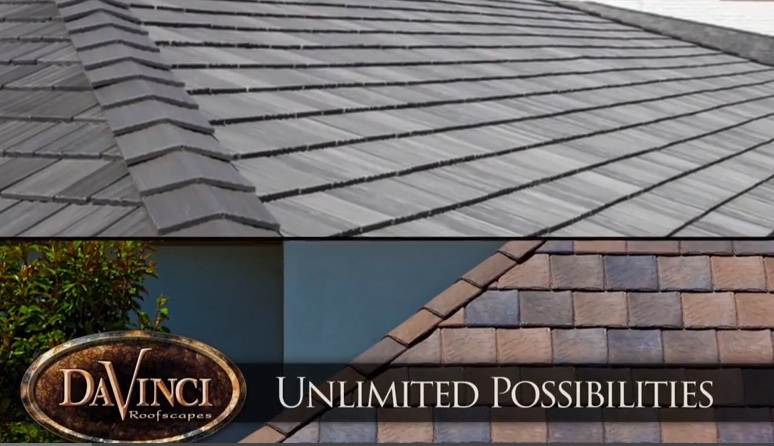 Welcome to the DaVinci Roofscapes website — your one-stop shopping location for information on synthetic shake and composite slate roofing tiles. Start your shopping and research visit to our website at our PRODUCTS section. That's where you'll gain a fast overview of our Multi-Width, Single-Width, Bellaforté, Fancy Shake and EcoBlend product lines. Next, gain the details you need in our HOMEOWNER TOOLBOX. This section of our website includes overviews of residential projects, tips on how to select a roofing contractor and easy ways to obtain literature. A fast-read comparison chart in this section also shows at-a-glance information comparing our polymer roofing products to natural roofing products and other synthetic materials. When you're in need of inspiration and guidance, visit our COLOR & INSPIRATION section. Here you'll find a free online color designer tool where you can create a personalize color blend for your roof. Plus you'll find our free downloadable color e-books from color specialist Kate Smith. We're not done yet. On our one-stop-shopping site you can also find a GALLERY of more than 300 images showing DaVinci products on structures, plus a "Locate a Contractor" link where we connect you with a roofer in your area! 365 days a year, 24/7 … you can get all the roofing information you need at www.davinciroofscapes.com.